58134 • Tamiya Newman Haas K-Mart Texaco Lola T93/00 • F103L • (Radio Controlled Model Archive) • RCScrapyard. 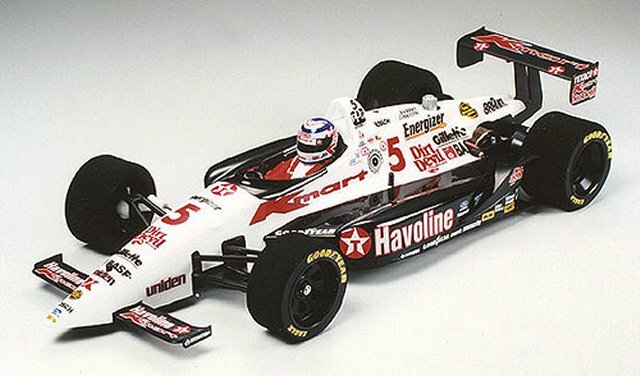 Released by Tamiya on March 15, 1994, the Newman Haas K-Mart Texaco Lola T93/00 was driven by Nigel Mansell to win the 1993 Indycar World Series. Based on the F103 chassis, the F103L has a longer wheelbase and to give the chassis more rigidity it employs a double deck configuration. Like the F103, the F103L chassis has a number of changes from the old F102 chassis. The chassis plate and motor mount were re-designed, a two part upper deck was added and a friction damper coupled with a damper plate assembly was included and the steering servo re-positioned. 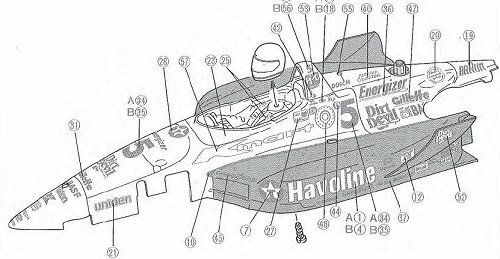 In the old F102 the steering servo was laid on its side, this meant the tie rods were different lengths, giving the car a different turning circle on the left to that right. In the F103L, as it is in the F103, the servo is held upright in a fixed frame, allowing the rods to be of even length, giving equal turning circle and improved steering. In conclusion. I never actually raced the F103L chassis, but by all accounts the design worked well.